Self Drive safaris in South Africa are a highly flexible way of discovering and exploring the country's awesome wildlife and scenery, giving you the freedom to make your own plans and itineraries and change and adjust them at short notice and at will. Considering what is all involved, a first time visitor might feel overwhelmed and have second thoughts, thinking that a self drive safari might be lot of effort and stress. For those however who like to be independent and want to do their own thing, nothing could be further from the truth. For them a self drive safari is going to be an awesome experience. Keep in mind that there are many variations of the "do it yourself" element, it all depends on your wants and preferences. 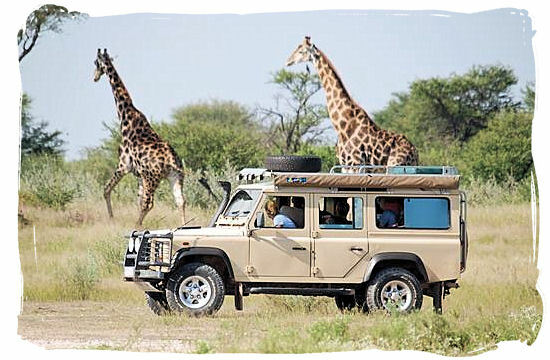 On a guided self drive safari tour for example, you will be met at the airport upon arrival. Accommodation and car hire arrangements will have been taken care of. You receive the all-inclusive itinerary that you have chosen together with the necessary maps and off you are, exploring the unknown under your own steam. A satisfactory infrastructure in terms of proper roads and traffic signage is a prerequisite for a problem free and easy going self drive safari. That is why South Africa with its excellent and up to date road system is such a popular safari destination. Good roads together with a first-rate mobile phone network offering a wide ranging coverage, makes it a favorite among the do it yourself safari enthusiasts. With countries such as Botswana, Namibia, Zimbabwe, Zambia, Kenya, Tanzania and others it is a different story. The roads are mostly gravel and deteriorated and conditions can be hazardous at times. So, unlike South Africa, it is a "must" to drive a vehicle with a full 4 wheel drive capability. A guided self-drive safari with everything taken care of as described above might be a good option here. Next to going on an individual self drive safari in South Africa, there is also the option of joining a convoy consisting of a number of vehicles forming a self drive group safari. This can be a group of individuals with a common itinerary or an organized group led by a professional guide. The advantage is that you greatly reduce the risk and stress of a solo undertaking, while maximizing the enjoyment of your safari experience. Whatever you need in terms of vehicle and equipment can be hired. They are all written by reputed guidebook authors and travel writers who work for leading guidebook publishers and/or specialized Africa magazines. All have been professionally involved in the safari industry for years and visited many parks and reserves. 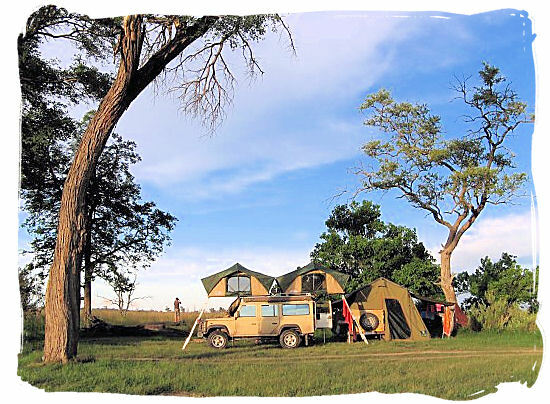 Fully equipped self drive safari camp in Moremi game reserve in Botswana. What you see here is the camp of a family comprising mom, dad and five children ranging in age from 6 (pair of twins) to 16 years on safari in Botswana. Fully equipped in this case means an eight seater 4 wheel drive Land Rover Defender and a custom designed trailer with a build-in cooking unit. They are equipped to carry all the needs in terms of foodstuff, liquids, clothes, petrol etc. for the family to be self-sufficient for 10 days. Sleeping accommodation is in the form of roof tents on top of the vehicle and the trailer. At night inside the tents the occupants are quite safe against the wild animals that come wandering in and around the camp. They are used to vehicles with tents and usually ignore them, provided there is no foodstuff lying around. Giraffe encounter on a self drive safari in Botswana. With the roof-tents folded up on top of the vehicle and the trailer left behind at the camp, mom, dad and the five kids are on a game drive, exploring the region surrounding their camp. To come across a pair or even a herd of giraffes is always a highlight on any game drive. The wonderful thing of a self-drive safari is that you are fully independent and to do your own thing when and wherever you want. At the same time it is one of the most cost effective ways to explore Southern Africa's wildlife parks and game reserves. 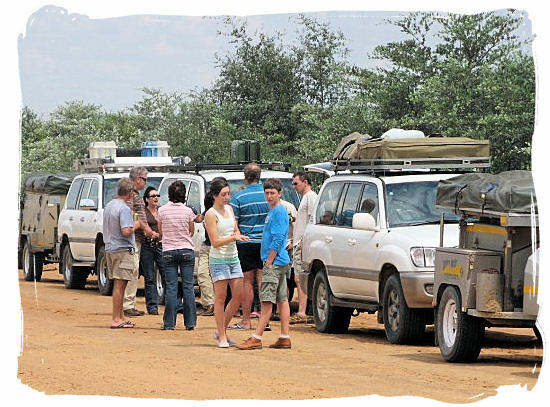 A Small group of families and friends on a self-drive safari to Khutse game reserve in Botswana. They all travel in 4 wheel drive vehicles, which is a necessity in Botswana because of the difficult and often tricky road conditions. In the remote wilderness regions roads often consist of a couple of tracks only with either deep sand or water and mud, depending on the season. This is also the reason why tourists are strongly advised to travel with more then one vehicle in pairs or groups whenever possible. It is a lot safer, one can tow the other out when he gets stuck in the sand or mud, or go and seek for help at the nearest settlement. When you do go on your own, keep in mind that the wildlife reserve you want to visit are utterly remote and uninhabited. If you get stuck it can take days before somebody passes by who can help you. The minimum you need to take along to enable you to make contact with the outside world and ask for help is a satellite telephone together with a good GPS system and up to date maps. 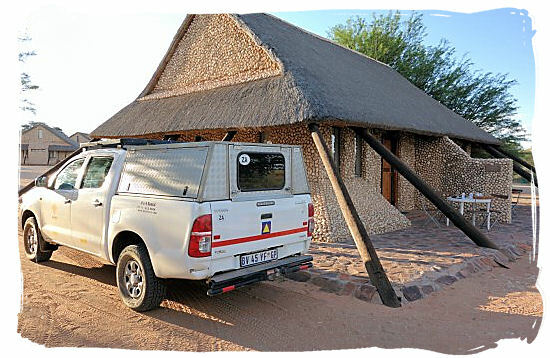 The 4 wheel drive Toyota Hilux vehicle, especially equipped for safari travel that we rented for our 8 day self drive safari in the Kgalagadi Transfrontier National Park. It is parked next to the chalet that we stayed in at the Twee Rivieren main camp of the Park. Serving a variety of budgets and tastes, the camp offers different types of accommodation such as chalets, family cottages and camp sites. Covering 3,6 million hectares (38,000 sq km) Kgalagadi National Park is an amalgamation of the Kalahari Gemsbok Park in South Africa and the Gemsbok National Park in Botswana. It is situated in the Kalahari, a huge 900,000 sq km semi desert in the west of Southern Africa. The Park is traversed by two dry river beds, the Auob and the Nossob, which join each other just north of the Twee Rivieren camp. It is home to a wide variety of wildlife including predators such as Leopards, Cheetahs, Hyenas and the renowned black-mane Kalahari Lions. "I traveled to Kruger National Park in South Africa and I was so excited to be living out a childhood dream of mine. I couldn't believe that I was going on a safari in Africa and was going to be face to face with the Big 5". Watch this video and see if he really did. Short video showing how you can experience extraordinary wildlife action on a Self-Drive Safari. It was taken by Mari Auranaune, also in the in the Kruger National Park in South Africa. When we got there, there were quite a few cars there and they had been there for a little while already (I believe). They had spotted the Leopard on the side of the road. When we got there the leopard was still in the bushes. We could see that it wanted to cross the road and at that time we didn't see the impala. We only knew about the kill until it dragged the impala up on the road. Amazing to watch!! This happened 15 km north of Tshokwane picnic spot towards Satara Camp. Another amazing video also about a Leopard and again in the Kruger National Park This time a Leopard walks around and around a car, totally absorbed by its reflection on the shiny body of the car. It was taken by Annemarie du Plessis at the Kumana dam south of the Satara rest camp. Video showing a group of tourists on a Self-Drive Safari in Botswana and Namibia with hired 4x4 vehicles. You will see that conditions are quite different from those in South Africa. The roads are mostly very sandy or muddy depending on the season, so a four wheel drive vehicle is a necessity. Whereas in South Africa's national parks the roads are mostly hardened dirt roads or even tarred in the case of some main routes. All you need is an ordinary two wheel drive vehicle.